BlackwaterBLUE from monkster.com: Now it's KKK (King Kenny's Kalou)! 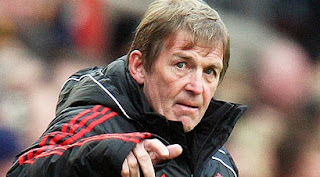 Now it's KKK (King Kenny's Kalou)! Liverpool are reportedly considering a move to sign attacker Salomon Kalou this month. The 26 year old forward is currently preparing for the African Nations Cup but is said to be in talks with Arsenal with regards to a move across London but now Anfield director of football Damien Comolli is apparently ready to enter the race for the Stamford Bridge man. Kalou has just six months left on his current Chelsea contract and seems very unlikely to sign a new deal given that he has slipped behind the likes of Didier Drogba, Juan Mata, Fernando Torres and Daniel Sturridge in Andre Villas-Boas’s pecking order. Liverpool could well do with alternative attacking options as currently they have just two recognised striking options in the form of Luis Suarez and Andy Carroll and though Kenny Dalglish does have veterans Craig Bellamy and Dirk Kuyt as back-up options both are more commonly used as wide players, hence the need to beef up the club’s attacking complement.